As with all old buildings I like to stand and visualize them in their heyday with large groups of people working away. I see in my minds eye the machinery and hear the clangs and clatters as it is used. I hear the voices of instruction, correction, encouragement, banter and also the laughter. I feel the heat, the cold or the dampness. I remember that children of a young age, often only into double figures, worked long hours for a pittance. Life back then was very ‘local’. Without our modern means of transport and communication, life revolved around the mill or factory. Romances blossomed over or behind the machinery. One generation followed another into the factory. I think of the offices with the high desks where the clerks sat on high stools or chairs. These staff dressed and indeed addressed each other formally. There was no going to work in sports wear or looking like you had slept in your clothes for a week and forgotten to brush your hair! The furniture was heavy and there were no castors to aid with moving it. Decoration and paintwork were dark and the windows were high and small. Lighting was poor, and coffee machines unheard of. In fact eating at work would be frowned on. All records of the work were hand written into large ledgers using dip pens. Any mistake, misspelling or ink blot was permanent. The accounts involved long and cross tots; mental arithmetic, a pencil and eraser the only aids. Orders, invoices and receipts were hand written ready to be delivered by messenger boys. Wages were paid weekly by cash counted into the hand of each employee. The cost of breakages or for time lost was often deducted. Holidays were few. In these parts the annual holiday was a day out to Portrush on 13th July. So today on Ada Lovelace Day* an international celebration of women in technology that centres around the use of blogs. I am pleased the workplace has advanced to the stage that it is, wherever we are, user friendly bright and warm. Three cheers to our women in Technology today. On behalf of future generations we thank you! * Ada Lovelace was born in 1815, and is recognised as one of the first computer programmers. She wrote programs for Charles Babbage’s Analytical Engine, along with the very first description of a computer and software. This entry was posted in Uncategorized on March 24, 2009 by Grannymar. For about half of my life I was afraid of dogs and it took about another ten years for me to tolerate them near me. 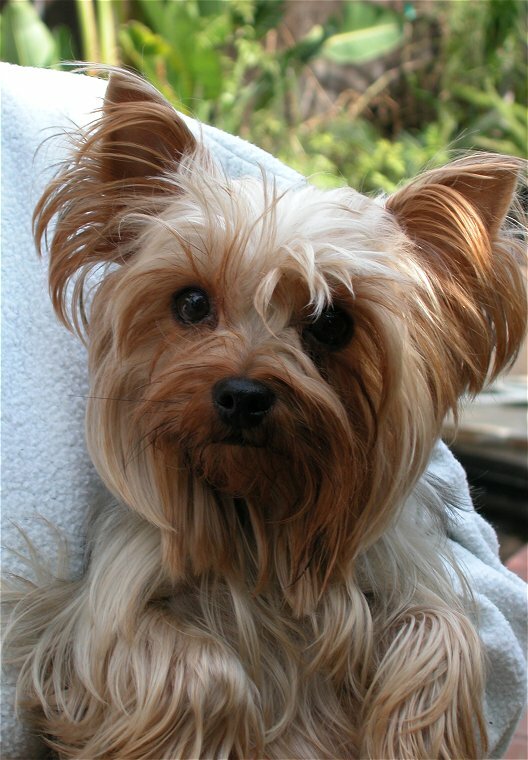 About ten years ago while visiting friends I was the recipient of curious looks and sniffs from their two miniature Yorkies. Once they decided that I was friendly and not foe, they took a run across the room and up my shins to circle on my lap before finding a cosy spot to sit and then sleep. I was smitten. I fell in love that day and if I was ever to share my space with a pet it would be a Yorkie. No not the chocolate bar, the breed of dog! I do not like cats and don’t want them near me. There was a discussion on Twitter yesterday about dogs and chocolate. You know the kind of thing … Is chocolate good or bad for dogs? I have heard several discussions on the topic over the years and they have all come to the same conclusion. Poison by chocolate can occur quickly if your dog had a large amount, but sometimes even small amounts will show signs of poisoning within a few short hours. Symptoms include vomiting and diarrhea, restlessness and hyperactivity, and he or she might even go to you for help and answers. Symptoms will progressively get worse from restlessness to arrhythmia and other muscle twitching. Frequent urination is common, a direct side affect of the toxin in chocolate. If you (like me) have a habit of sharing your finger foods with your dog you always have to tell them no when you have any sort of chocolate. Eventually – they will learn to associate the scent as something they just simply can not have – and will usually just leave you alone. Those quotes came from a very interesting article that you can find here. The last one made me think…. it is all down to how you train your pet/s. My sister (E) is an animal lover and she has two dogs and 2 cats. Since she lives alone the animals have the run of the house. They walk, jump and sleep on the furniture including the beds. They are around at meal time. E shares titbits of food with them from her plate. They expect the same from visitors and if you ignore them, as I try to do, they jump up like beggers. They are very noisy yapping barking most of the day. E will break off from talking mid conversation on the phone to speak to the cats & dogs. I have heard her tell the dogs: “It is Grannymar, and if you are a good girl she will bring you Malteesers!” This I ignore since I discovered that choclate & dogs don’t go together. The last time I stayed the barking was getting me down. We had a general chat about training young animals and she told me she used vinegar to teach them not to ‘piddle’ in the wrong places. It is harmless but dogs do not like the smell of vinegar. I asked it it could be used to teach them not to bark. E produced a small spray bottle and I half filled it with vinegar and topped it up with water. Everytime the dogs barked I sprayed the vinegar in their direction. After a few sprays I made the sound of the sprayer mechanism as I worked it. By the end of the day they had the idea…. I cupped my hand as if it held the bottle and made the noise… they stopped barking! Some weeks later I was talking on the phone to E and she was using speaker phone. She told me the dogs were looking everywhere to find me since they could hear my voice. She found it amusing and started to laugh. The laughter set the dogs barking and their noise drowned out my sister’s voice. I made the noise of the spray bottle and immediately there was silence at the other end of the phone! A week later I did the same thing and once more the dogs went quiet. To use an old saying of my mother’s…. “It all reflects on the home training”!